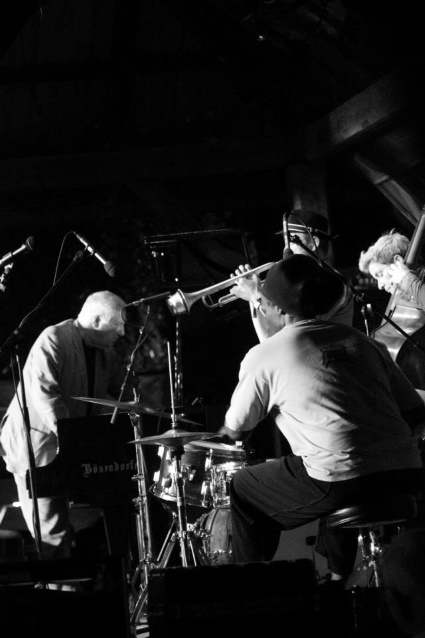 The debut of Franz Hautzinger’s Quartet was a productive clash of cultures with John Tilbury, Rozemarie Heggen and Hamid Drake: While Hautzinger’s trumpet hadn’t been sounding so melodic in a long time, and sometimes made you think of Chet Baker, Drake played the drums in the distance. The 77 year old Tilbury underlaid the carefully inventing sound structures with economical piano chords, as if he were lost in another world. Highlight! 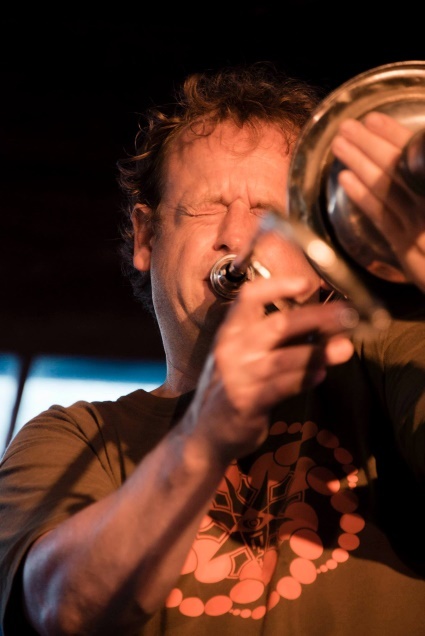 The Austrian trumpeter Franz Hautzinger, born in this region, put together a band for the festival and came up with a Quartet with bassist Rozemarie Heggen, cult pianist John Tilbury, and drummer Hamid Drake. A peculiar combination, but one that led to perhaps the most beautiful surprise of the festival…. The concert focused regularly on small details – barely audible variations in Hautzinger’s playing, Tilbury's fingers which performed a whispering dance on the keys -, but the result was an immense coherent listening experience, intoxicating in its effective implementation and nowhere far fetched. Even the ringing of the bells in the night seemed to join in just at the right moment. The synth by Patrick Pulsinger lay nicely embedded in the group sound, which was very visual, and recalled images of perspectives and other ethereal panoramas. Hilary Jeffery’s trombone was central, but it was sometimes cunning music, which took you along a sometimes noisy trail, or you were unwittingly involved in a hugely compelling, rhythmic story full of rolling grooves, noisy guitar (Alfredo Genovesi) and trombone layers…. also drummer Steve Heather had (almost) unnoticed played a beautiful performance.